The title might be as good as Celtic’s, but there is still plenty of excitement to grip Scottish football fans as we head into the home straight. Who can say with any great conviction which Premiership club will be making the drop into the Championship, who will have to scrap for their survival in the play-offs and who will finish third? The last mentioned might at first not sound so significant, but it sums up what has been a terrific season. One manager’s future and another’s standing in the game are likely to depend on the outcome. 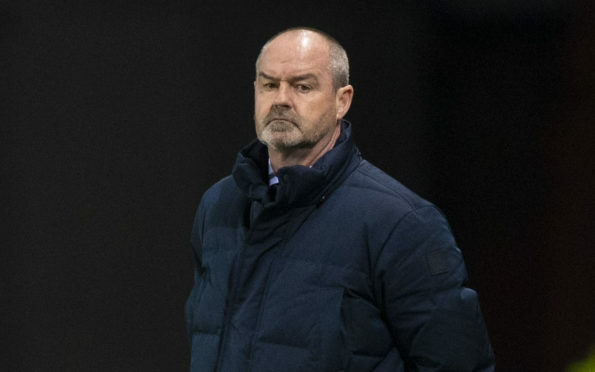 There has been plenty of speculation about whether Steve Clarke will quit Kilmarnock in the summer. I understand he will stay on for 2019-20 – provided his players can provide him with the challenge of a European campaign to complement the domestic action. For that to happen, they are going to have to best of the rest, outside the much-wealthier pairing of Celtic and Rangers. Specifically, they are going to have to finish above an Aberdeen side led by Derek McInnes. No easy task. The Dons’ situation is a little different. Unlike Killie, they still retain an interest in the Scottish Cup, with a semi-final clash against Celtic to look forward to a week today. And before their chances of upsetting the Hoops’ Treble Treble push are written off, it should be remembered the Granite City club beat Rangers at Ibrox in the quarter-final replay to book their place in the last four. Likewise, that they have already held Celtic under the charge of Neil Lennon to a draw at Parkhead. However, for me their big target will be to grab the Europa League spot by finishing third in the Premiership. Runners-up behind Celtic for the last four seasons, McInnes will see it as vital not to drop any more than one position. Not least because doing so should cement his position as Scotland’s Manager of the Year, a contest that has been hard to assess this season. Brendan Rodgers will get votes for steering Celtic so far along the road to a third successive clean sweep before quitting for Leicester City at the end of February. The hasty manner of his departure will stop him getting the support he would have otherwise been able to count on. While Rangers manager Steven Gerrard has been a very refreshing addition to the Scottish game, he has not been able to break Celtic’s monopoly, so he won’t win. Gary Holt has done very well with Livingston in their first season back in the top flight. Stephen Robinson has rightly received plaudits for the way he has introduced exciting young talents such as Jake Hastie, David Turnbull and Allan Campbell into his side. Those, though, are the honourable mentions. By virtue of leading his team to the League Cup Final, where they performed with great spirit against Celtic, the Scottish Cup semis and within sight of another top-three finish in sight, McInnes is a serious contender. On Grand National weekend, it is probably best not to overlook a runner that appears to have been in the lead but now battles back in the main field. When Steve Clarke had Killie on top of the league, there would not have been a fair-minded fan in the country who would have denied him the Manager of the Year award. If his team can battle hard in the post-split fixtures to grab third and with it the promise of European football, then there must be every chance he will win it still. At the other end of the table, it is the penalty for failure, not the potential prizes on offer for success, which are the focus. Players’ contracts and the offers of renewals will understandably hinge on which division their club will be playing in. And with the top of the Championship having looked a decent standard, those in jeopardy will be desperate to avoid not just bottom spot but second bottom, too, with its threat of play-off peril. While Dundee v Dundee United would be great value for the neutral, and a fittingly frenzied finale, it would do nothing for the blood pressure of those involved.